Aeration and overseeding are important factors in keeping your lawn lush and healthy. In our region both processes are ideal for the late summer and early fall temperatures. By puncturing the soil with many little holes, the process of aeration allows air, water, and nutrients to reach the roots of the grass. The main benefit of aeration is lessening the amount of soil compaction. Lawns that are heavily used, were part of new construction, easily dried out, or established by sod. Aeration also helps reduce the amount of thatch built up in your lawn. Overseeding is a proactive way to keep your lawn healthy by spreading grass seed over your existing lawn. As your lawn is used and the grass matures it naturally thins. The process of overseeding begins with establishing goals for your lawn, correctly timing the process, and preparing the area by mowing the lawn extra short. While preparing for overseeding, it is a great time to correct existing problems in the lawn. Lastly you will select a grass seed, spread the seed, and fertilize overseeded areas. Sound complicated? 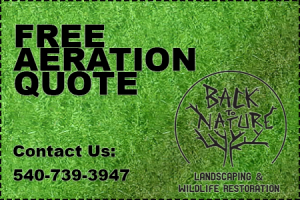 Let Back to Nature Landscaping provide a free quote for your aeration and overseeding needs. Back to Nature Landscaping provides aeration and overseeding services using a custom blend of grass seed designed to maintain a healthy lawn all season. This blend is Class A rated for color, drought and disease tolerance, density, overall turf quality, and certified weed-free. Even the best grass varieties weaken with age. This is the perfect time of year to refresh your lawn for the next season.